The prolific game show composer turned format devisor shares his insights into the hit new ITV show 1000 Heartbeats. Paul Farrer is best known in the game show universe as the composer of the iconic themes of shows like The Weakest Link and ITV’s The Chase. His first game show format, 1000 Heartbeats, has been met with critical acclaim and positive viewer support. I sat down with him and asked him a few questions about his experience in the industry, pitching a new game show and the response he’s gotten. Cory Anotado: I think a lot of people know your name from composing the great music packages for The Weakest Link and The Chase. How did you get into devising game show formats? Paul Farrer: I didn’t ‘get into it’ at all really. 1000 Heartbeats is the first idea I’ve ever had for a TV format. So I still feel like a complete beginner. It’s been a fascinating process though and I’ve learned a lot from it. CA: Where did you get the idea for 1000 Heartbeats? PF: I was on a cross-trainer at a gym and anyone who knows me will tell you that’s a rather unlikely environment to find me in. I was pumping away and I noticed for a brief moment that my heart rate was beating at the exact tempo as a piece of techno music I was listening to. It was the most wonderful feeling of being ‘at one’ with the music. I jumped off the machine and my heart rate slowed but, of course, the music stayed up. I wanted to take the music with me. In my ‘day job’ as a TV composer a huge part of my work involves thinking about the tempo and tone of music I’m composing to try and elicit an emotional response from the listener. I began to wonder if it would be technically possible to drive a piece of music from the tempo of someone’s heart. I also wondered how it would feel if by driving the tempo of a menacing piece of music it might scare or distract you into making your heart beat faster. It would eventually be a feedback loop of stress and tension. I loved that idea and obviously the gameshow format was a perfect platform for it. Without being too deep or philosophical, I like the notion that we all have a finite number of heartbeats in our lives and we have to choose what we do with them. I expressed this as the metaphor of a player’s life literally draining from them with each passing heart beat (instead of using the more familiar ‘clock’ motifs we all run our lives by). I also liked the idea of bad decisions or wrong answers removing a chunk of heartbeats from your dwindling total. CA: A lot of our readers are curious as to how game show formats get pitched and picked up. If you can, could you talk about the process you took from idea to television? PF: I typed up my idea into a pitch document—basically two pages with the outline and the idea on for starting with 1000 heartbeats, reducing overtime plus the heart beat penalty if you got a question wrong etc and the mechanic of the live quartet. I printed it out, then put it in a drawer and forgot all about it. Having worked on so many TV programmes as a composer over the years (pretty low down the food chain) I always assumed cleverer people than me created TV ideas and that I was silly to even mention it to anyone. Then one day I was at Elstree Studios in London at the wrap party for a show I’d composed the music for (Dancing on Ice) and I drunkenly mentioned to Jane Beacon, the Executive Producer, that I had an idea for a game show. People in her position get pitched at all the time and I could see she was winding down with friends and not really in a work mode, so I knew I had to be quick. I downed my gin and tonic and pitched it to her in about 30 seconds. It was like a light went on in her brain and she absolutely got the joke. She was the real champion of the show and without her it simply wouldn’t have happened at all. A while later Jane took me to see Helen Warner, the incredibly talented Commissioner of Daytime at ITV. No-one in the commissioning department knew who I was—I had no track record—I was basically some unknown guy off the street who had never had a show idea before, let alone pitched one to a commissioner. CA: Every game show has something unique that makes it stand out. 1000 Heartbeats has a dynamic, live soundtrack that plays right in studio with the contestants, with the tempo of the music based on the player’s heartbeat. Where did that idea come from? I knew the music had to be performed live. So few people have been lucky enough to experience being in the same room as top notch orchestral performers and anyone who has will tell you how much the music reaches into you, grabs you by the soul and tells you how to feel. I wanted the music to be both reflective of the contestant’s emotional state (we play the music how their heart tell us to play) and both influential on it (we scare and distract them so that their heart rate increases). For years I’d been involved in so many shows where the music was treated often as an afterthought but for this show I wanted to see if it was possible to make a statement about how if you take the music component seriously it can pay the show back ten-fold. Or perhaps you could say that after years of writing music to go with game shows I decided to create a game show to go with some music I’d written. CA: Technically speaking, how is all this put together? Watching some episodes, you don’t see any heart monitors on the contestant. How are you translating heartbeats to tempo live? PF: Contestants wear a wireless heart rate sensor across their chest, underneath their clothes. It was developed by a medical technology company in Cambridge called Hidalgo (there aren’t many quiz shows that involve a clinical research element!). We translate the output from this into a tempo clock, which drives everything. My music computer on the studio floor gets its tempo from this clock and runs some live backing track elements (drums, bass, etc). 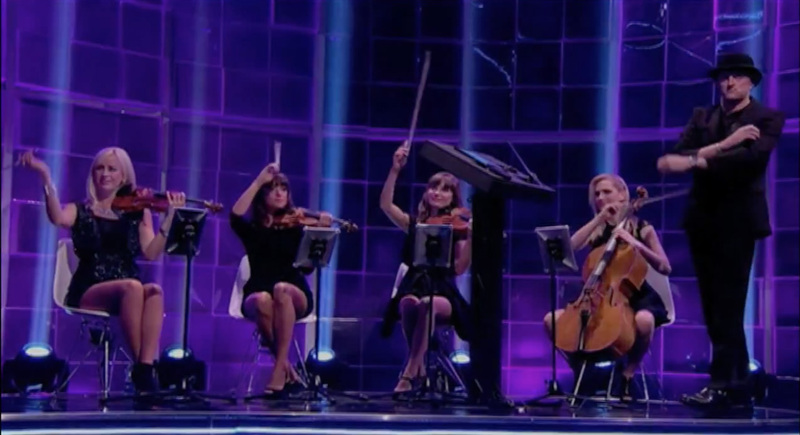 Myself and the quartet also get this as a click in our ears as well and we play live along to the beat of the contestant’s heart. We approached the audio as a live concert performance and there is no tweaking or post production of the music afterwards. Our sound department are basically the same guys that do loads of live music shows such as Later With Jools Holland and Glastonbury. So from this point of view its a live music event. It’s really only time and budget that stops us from using a full orchestra. If the show gets picked up overseas, I’d also like to make the music location specific. So that if, for example, Chinese TV wants to do their own version of the show, I’d like to imagine them using the Beijing Symphony Orchestra and 15 percussionists. Tell me you wouldn’t tune in to see THAT! CA: Who comprises the 1000 Heartbeats Quartet and what are their professional backgrounds? They are all really accomplished London orchestral players who record and perform live with some of the world’s biggest names like George Michael, Kylie Minogue, Kanye West etc. They also record at Abbey Road in movie score orchestras. As a composer, it’s always rewarding to have terrific players performing your music and they knew that this project was going to test the limits of their abilities. To be asked to approach every piece knowing that seconds before they start they might need to be performing it at 60 or 180 BPM and constantly moving through every tempo in between is a lot to ask any instrumentalist. These girls played flawlessly every time and literally never missed a beat. CA: As the creator of this format, how much input did you have in terms of production details? Set, graphics, etc. Obviously, as composer, you had a heavy hand in music, but was there any other decisions that you had or did those details get passed on to someone else? PF: For me, this has been an exercise in letting go. I’ve had a career of people commissioning music from me telling me to make the music sound ‘more orange’ or ‘can you remove the guitars from the mix’ when there aren’t any guitars in it, for example, so I know how frustrating it can be trying to be imaginative with someone breathing down your neck. Of course I had some ideas (mostly about tone and colour) for the details but I’m grown up enough to know where my strengths lie. The production company Hungry Bear and my Executive Producer Dan Baldwin have incredible TV instincts and while I was involved in it all, most of the time it was about getting the best people on board and trusting their creativity. My experience with recording singers and musicians over the years is to give them as much creative freedom as possible and so we did with everyone involved in 1000 Heartbeats. CA: Host Vernon Kay always seems to be so focused on the game. He’s very emotive during tense situations—like we are, watching at home. How do you feel Vernon’s performance is as the host? PF: My main objective for 1000 Heartbeats was realism. I wanted real strings, real performances, real emotional responses and real moments of genuine people experiencing the tension and elation of winning big money on TV. You couldn’t be in the studio and see all that unfolding in front of you and not be drawn into it, and as such the host’s capacity to translate this to the audience was always going to be important. Vernon absolutely knocked it out of the park and we are incredibly lucky to have him on board this project. Entertainment performances are an often over-looked genre (particularly game shows) but his capacity to draw things from contestants, draw viewers into the show and hold it all together with enthusiasm, humour, and passion is nothing short of incredible. My role and the role of the quartet is kind of indifferent towards the contestants. We are the machinery they are up against—the cold end of the studio. Vernon is their friend, encouraging them and supporting them. He really REALLY wants them to do well and contestants respond brilliantly to this. It’s an honour to have his talents, and the talents of the entire team work on making my idea a reality. We were blessed with so many amazing people on this show and I continue to say that working with them and seeing them bring 1000 Heartbeats to life has been the biggest privilege of my career. Thanks to Paul Farrer for his time in answering my silly questions. 1000 Heartbeats airs Monday through Friday at 4:00 GMT on ITV.